With hundreds of thousands of refugees in urgent need of humanitarian assistance, particularly across the Middle East and Europe, Imagine Dragons and SAP SE are joining forces to introduce the One4 Project to support refugee relief efforts. The One4 Project symbolizes the exponential power of one by encouraging people to download the Imagine Dragons’ newly released song “I Was Me,” now available exclusively on iTunes worldwide at iTunes.com/IWasMe. Apple, KIDinaKORNER/Interscope and Imagine Dragons will donate their respective proceeds to the UN Refugee Agency (UNHCR). Further, SAP will also donate USD 10 cents for every download up to the first 5 million downloads from iTunes. 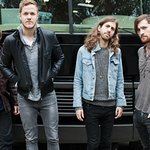 KIDinaKORNER/Interscope recording artist Imagine Dragons is scheduled to publicly perform “I Was Me” tonight for the first time, live from the SAP Arena in Mannheim, Germany. The SAP Arena is among the first stops of the band’s Smoke + Mirrors European leg.